Former world champion Jacques Villeneuve may have competed in his last Grand Prix after pulling out of the final race of the season. Villeneuve, who has lost his seat at BAR to Takuma Sato, told team bosses he wanted to be released from his contract immediately. "Jacques is extremely disappointed not to be staying with the team next year," his manager Craig Pollock said. "He simply felt that his heart would not be in it for the coming weekend." BAR boss David Richards said he had no hesitation in agreeing to Villeneuve's request. "If somebody doesn't want to drive, they don't want to drive and so Takuma will be driving on Sunday," he said. Villeneuve, who won the world championship with Williams in 1997, has been forced to play second fiddle to team-mate Jenson Button this season as the Canadian's car suffered reliability problems. 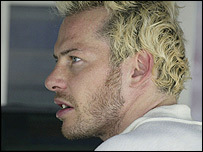 Button, who has twice as many points as Villeneuve, said he was disappointed to hear of his former team-mate's decision. "Hopefully, Takuma will do a good job and the pressure won't get to him," he said. "It's disappointing that he (Villeneuve) won't be here for his final race. "But things change. He's been there five years and had ups and down. It's disappointing to see him leave Formula One." Sato, who steps up from test driver for BAR, achieved his career-best result at the Japanese Grand Prix last year when he finished fifth for former team Jordan. "This was not what I was expecting for this weekend," said Sato. "I cannot express how excited I am to be making my debut for BAR in front of my home crowd. It is going to be pretty crazy, but I am confident that I can do a good job." Villeneuve has not yet received any offers of a drive for next season, meaning his 130-race career looks to be at an end. F1 boss Bernie Ecclestone said he had tried to find a seat for the former world champion but admitted: "The truth is no one wants him." Villeneuve has been with BAR since it was set up by Craig Pollock in 1998 but managed just two podiums for the team in five seasons. How much for a logo? What do the flags mean?